“A rare experience of a moment at daybreak, when something in nature seems to reveal all consciousness, cannot be explained at noon. Yet it is part of the day’s unity.” – Charles Ives. I bird when I drive. While I can’t identify every bird that comes in view through my windshield, I have learned the tricks to identifying many. A red tail glinting in the sunlight from a large overhead bird is most certainly a red-tailed hawk. Brown birds with yellow throats that flash white on their tails as they dash away are meadowlarks. Kestrels present a hunched profile as they sit on wires. Northern Harriers have a broad white band on their rumps as they circle above, and mockingbirds flash white on their wings and tails as they swoop from one tree to the next. I saw all these birds and more this week as I drove through Texas’ Hill Country. They’re birds I see on almost every drive I take through the Lone Star State landscape. What I don’t see often are greater roadrunners, like the pair I saw just outside of the Enchanted Rock State Natural Area on Friday. Since I don’t see them as often, the sight of them thrilled me more than did all the others I saw this day. It’s sad that the rare bird takes the attention away from the more common, yet just as fantastic bird. It’s human nature – and of course we’re not just talking birds here. The underdog: Wile E. Coyote as Looney Tunes saw him. The sight of the roadrunners took me back to my childhood – and the Looney Tunes’ cartoons about Wile E. Coyote and the Roadrunner. The funny looking bird always came out on top, which is probably why I always rooted for the coyote. Back then I felt more in tune with underdogs than winners – most kids do, I think. Today I root for them both. 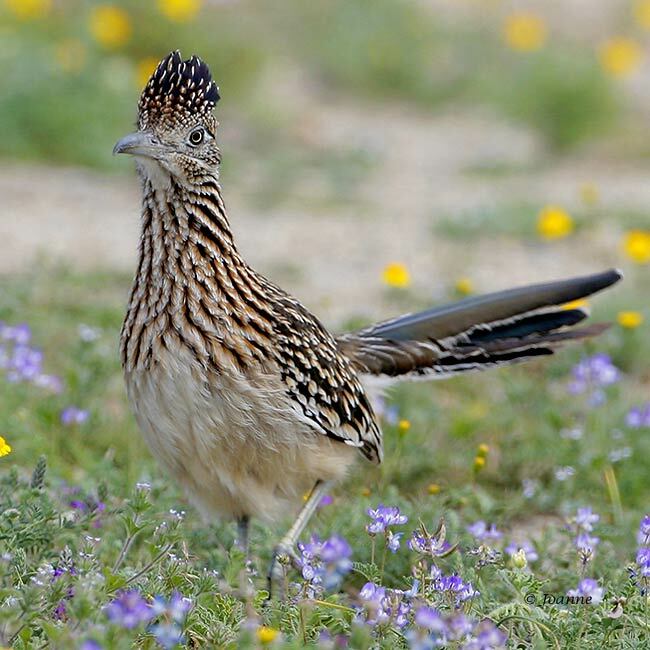 The roadrunner because I’m passionate about all birds and the coyote because I admire this animal’s will to survive in the face of human development. The truth is I’ve actually seen more wild coyotes than I have roadrunners. The pair I saw Friday only brings my total sightings of greater roadrunners up to about a dozen. But since more of my birding is taking place in Texas these days, I expect that number will begin increasing. Wouldn’t that be fun. Beep, beep! Visit Cedar Hill State Park located between Dallas and Fort Worth. I saw several there. Roadrunners are just like rare jewels – so terrific when you spot them!